St. Scholastica's choirs will present sacred and secular music of the Christmas season during a two-night performance of their annual "O Holy Night" concert at 7:30 p.m. Friday, Dec. 15 and Saturday, Dec. 16 at the Cathedral of Our Lady of the Rosary, 2801 E. Fourth St., Duluth. The performances will raise funds for CHUM. "We are thrilled to collaborate with CHUM this year for our ‘O Holy Night' concert," said Bret Amundson, St. Scholastica's Director of Choral Activities. "The College of St. Scholastica Choirs are dedicated to making a difference in our community through music, and we are honored to share this concert to raise funds for the Steve O'Neil Apartments. We're also excited that this will be our first year performing at the Cathedral." The "O Holy Night" concert, a popular holiday tradition in the community, will feature the St. Scholastica Choir, Bella Voce, Cantus Corde and Vox Anima. They'll share the story of Christmas through seasonal pieces from across the globe. 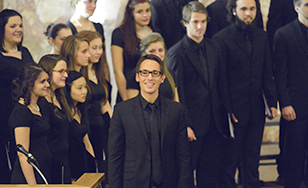 The event marks the first time that St. Scholastica's choir programs have collaborated with CHUM, which has held holiday concerts as fundraisers for the past 22 years. The concerts are a major fundraiser for programming at the Steve O'Neil Permanent Supportive Housing Apartments, which are bringing stability and a sense of community to families in need, according to CHUM Executive Director Lee Stuart. "Children are engaged in early childhood education and many residents are becoming aware of how their choices affect them and their families," Stuart said. The College of St. Scholastica Choir is an auditioned ensemble that performs a wide range of music from various historical periods, styles and cultures. Bella Voce is a 40-voice auditioned women's choir focused on providing women with opportunities to sing high-quality and challenging music from all genres. Vox Anima, a women's choir, and Cantus Corde, a men's choir, perform music of the past and present, from composed to folk to world music. Tickets are $10, and attendees will also have a chance to donate to CHUM during the concert. Refreshments will be served after the performance. For more information, visit spotlight.css.edu or call 218-723-7000. "Elements," 7:30 p.m. Friday, April 27, 2018, Mitchell Auditorium.